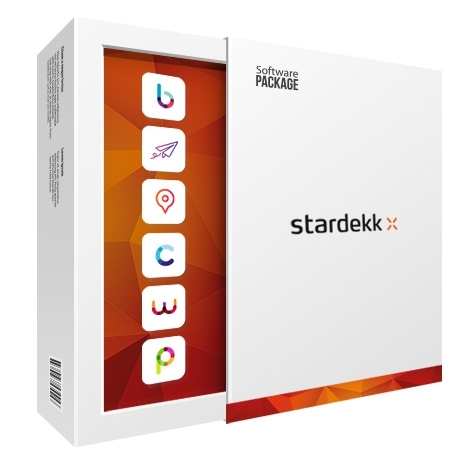 From booking online to checking out guests and cleaning rooms, Stardekk offers a time-saving tool at every stage of the customer experience that will lighten your workload as a hotel or restaurant manager. Our hotel software not only supports you with administrative tasks, but also helps you to increase your turnover at the same time. From now on, online visibility, direct bookings, remarketing and Yield management are among your possibilities. With Cubilis Booking Engine, guests can book a room effortlessly and securely via your own hotel website. This commission-free booking module increases the number of direct bookings and your revenue. Cubilis Booking Engine is, just like your other booking channels, connected to Cubilis Channel Manager. This allows you to easily manage prices and availability on different booking channels via one user-friendly control panel. Bookingplanner is a Property Management System (PMS) that simplifies the management of hotels, B&Bs or vacation rentals. Thanks to the synchronisation with Cubilis Channel Manager all the reservations are automatically imported into Bookingplanner. Check-ins, check-outs, breakfast and cleaning lists, clearly drawn up invoices? This hotel software helps you to keep an overview and simplifies the management of your daily tasks. With Little Restaurant you can manage all your reservations on a clear and structured dashboard. To avoid double bookings or no-shows, you can work with the credit card guarantee option or reservation requests. Guests can book easily and quickly through the booking engine, Restobooker, which is included in the software. You can personalise this user-friendly booking module so that it integrates nicely into your website. Stardekk creates websites that meet your specific needs and those of your customers. You can keep the content of the site up to date with Website Manager, an intuitive Content Management System (CMS). Thanks to the connection with the Cubilis software, the information about your rooms or arrangements is automatically integrated into your website. An extra night at half price, new menus or other special news can be processed in a personalised mailing and sent to your guests. E-mailinglist is a practical tool to keep your guests informed at all times. Thanks to the connection with Cubilis & Little Restaurant, you can inform your guests in a targeted and efficient way by using automated e-mails. Portal Booker is a cloud-based reservation system designed for tourism services and hotel associations. The online prices and availability of the listed properties are offered on the portal. Portal Booker helps to increase the online visibility of properties.